Drive your bike and enjoy the time you will spend here. If you like some new feelings, then choose this game and be ready to improve your driving skills. By the way, there are a lot of impediments that you must avoid. Is everything clear? Then have faith in your self! Have you ever drove your own bike? In this game all your dreams will come true! Just complete the levels without dying. Here is the checkpoints have been added to the new and improved levels just awaiting for you to show off your skills. 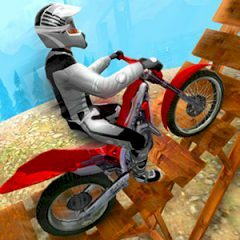 Be ready to pass a lot of levels of extreme action and height will leave you wanting more trial bike games in an instant, avoid obstacles and land your jumps just right or risk falling off your bike and embarrassing yourself. Enjoy the game and you will get so much pleasure and emotions. Have much fun!